Because CO2 reductions are not a linear function of MPG increases, it is very difficult to craft a sensible Cash for Clunkers bill using MPG. In terms of CO2 reduction, however, all GPM decreases are created equal: Saving 1 gallon of gas every 100 miles saves 20 pounds of CO2. As we’ve argued in many previous posts, the ideal Cash for Clunkers would be a tiered voucher system tied to GPM decreases. In this post, we’ll illustrate a simple tiered system using “gallons per 100 miles” (GPHM). First, we need to set a minimum GPHM savings. In previous posts we’ve argued that a trade-in that saves 1 gallon per 100 miles would offset the CO2 emissions that are released when manufacturing the new car in a reasonable period of driving. Specifically, 7 tons of CO2 are produced in manufacture, so the new car requires saving 700 gallons of gas to offset its production. A 1 GPHM decrease would offset the CO2 emissions from the new car in 70,000 miles of driving. Other proposals would require a 2.5 gallon increase per 100 miles to achieve this offset with less driving. We’ll work with a 2 GPHM principle: The minimum trade in that qualifies for a voucher must save 2 gallons per 100 miles. A trade in that saves the minimum 2 gallons per 100 miles would offset the CO2 from manufacturing the new car in 35,000 miles of driving. A trade in that saves a full 5 gallons per 100 miles (or more) would offset the CO2 from manufacturing the new car in 14,000 miles of driving (or less). Also, note that personal gas costs drop as a direct function of GPHM decreases. Assuming gas is $2.50 per gallon and you drive 10,000 miles in a year, the cost savings from saving 1 gallon per 100 miles is $250. Saving 4 gallons per 100 miles is worth $1,000 per year in cost savings. This tiered GPM system is simple. • It ensures covering the CO2 emissions from production of the new car. Why no maximum or minimum? Because all GPHMs are created equal. We don’t care where the reductions come from. Any time a gallon is saved in 100 miles of driving it reduces CO2 emissions by about a ton in a year’s worth of driving. Realistically, however, efficient cars will not be able to qualify for a large voucher. Someone who currently owns a 25 MPG car (which consumes 4 gallons per 100 miles) can qualify for a voucher by trading it in for a 50 MPG car (which uses 2 gallons per 100 miles). This yields a 2 GPHM decrease and the $3,000 voucher. However, someone who currently owns a 12 MPG car (which consumes more than 8 gallons per 100 miles) has many trade in options. The person could trade it in for a 16 MPG car (6.25 gallons per 100 miles) to qualify for the $3,000 voucher. Alternatively, the person could earn the $5,000 voucher by switching to a 25 MPG vehicle (which consumes 4 gallons per 100 miles--and save $1,000 per year in gas costs). The only limit, of course, is that people are not familiar with gallons per 100 miles. Yet. The USA Today’s automobile writer, James Healey, has started adding GPHM to his automobile reviews. We need the EPA, DOE, and Consumer Reports to follow suit. GPHM is an easy number to understand. And, from a policy perspective, it is differences in gallons per 100 miles that are directly connected to CO2 reduction. 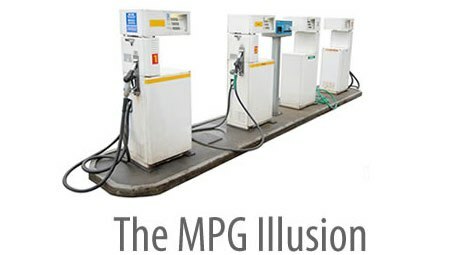 There are no "differences in MPG" that we can use to make clear, simple policy.